Regardless of how nice the unit is or how clean it looks, consider using pallets to keep your possessions up off the floor of the storage unit. If you’re on the ground level, there’s no way to ensure that heavy or windy rain won’t seep under the door. Furthermore, there’s no way to prevent spills from an adjacent unit from entering your unit and ruining valuable or memorable belongings. Use wrap wherever possible. Plastic storage wrap is important to protect your items from dust, insects, even rodents. Put a label on it. It may sound like a pain when you’re packing, but labeling will save you lots of time and headaches later. Expect changes in temperature. If you’re packing in the fall but expect your items to be in storage for several months, recognize that the temperature will fluctuate. Heat and cold can affect items like vinyl, electronics, and photographs differently so research the best ways to store those fragile items. Ensure the safety of your belongings. If you take the time to carefully pack, wrap, and label your items it’s also important to ensure that your items are secure. Look for a facility that uses locks, cameras, and personnel to ensure that your belongings are safe and sound. 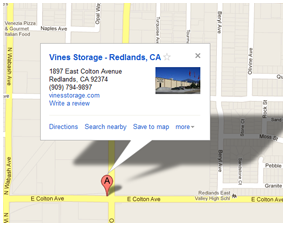 Vines Storage in Redlands, CA, knows that our job is to ensure that your belongings are protected and safe. With gate access for clients only, keypad entry into our units, more than 30 cameras that operate 24 hours a day, seven days a week, we provide top-level security and convenience. For more information on securely storing your personal items, call or stop by today. Our professional and courteous team is ready to help you.